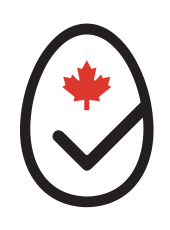 The Egg Quality Assurance (EQA) program is an industry-wide initiative that certifies Canadian eggs are produced according to strict food safety and animal welfare standards. All EQA certified eggs have met the highest standards of Egg Farmers of Canada’s Start Clean-Stay Clean™ and Animal Care Programs. No matter what type of egg you choose, EQA ensures Canadians get fresh, local, high-quality eggs produced by Canadian farmers. The EQA program involves the entire Canadian egg industry - from egg farmers and graders to processors and retailers. All are encouraged to work together to meet the requirements of the EQA certification and promote the benefits of purchasing EQA certified eggs to their customers. Visit the EQA website here.